DeLand Breakfast Rotary members are proud to name Lyle Wadsworth, M.D., F.A.C.P., as the 2018 West Volusia Citizen of the Year. Throughout his career, Dr. Wadsworth has been instrumental in nurturing and expanding several local charitable and religious healthcare organizations, including the Florida Lutheran Retirement Center, DeLand Men's Bible Study Fellowship, and most recently, as medical director and overall stalwart supporter of Good Samaritan Clinic – the area’s only free medical and dental clinic for qualifying residents. A graduate of Stetson University and Vanderbilt School of Medicine, Dr. Wadsworth has been a practicing physician in West Volusia County for nearly four decades. He began as a staff physician at Florida Hospital-DeLand in 1980, and has practiced medicine at Florida Hospital Fish Memorial, Florida Lutheran Health Center, Halifax Health Hospice, and Hospice Care Center in Orange City, Good Samaritan Clinic an Florida Hospital Community Care. Extending his expertise into the classroom, Dr. Wadsworth also has taught pre-med Stetson University students for 20 years, and medical and medical students through Florida State Medical School for nearly 10. Dr. Wadsworth is adding the title of West Volusia Citizen of the Year to his already impressive list of accolades. He has received multiple healthcare leadership awards by Adventist Health System, was named Top Doctor by Orlando Magazine from 2008 – 2012 and was named a Castle Connolly Top Doctor in 2014 and 2015. 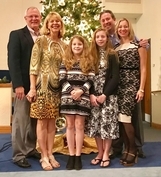 Dr. Wadsworth and his wife Gayle have two children, Jay and Elizabeth, five grandchildren, and live in DeLand. We are grateful to Dr. Wadsworth for his service to our citizens and their healthcare needs, and for his constant demonstration of compassion and faith. Please join us in honoring Dr. Wadsworth as the 2018 West Volusia Citizen of the Year. Each year during the Wild Game Feast, the DeLand Breakfast Rotary honors a West Volusian with the coveted "West Volusia Citizen of the Year" award.